Dr. Stephen Sinatra’s homebred Admirals War Chest, making his first start in more than 10 months, took the latest step toward a possible third straight victory in the Maryland Million Classic by running fifth in Sunday’s featured eighth race. Under jockey Steve ‘Cowboy’ Hamilton, the 6-year-old gelding dueled with Warrioroftheroses through solid early fractions of 24.42 seconds for the quarter-mile and 47.56 for a half before tiring in the stretch as 3-2 favorite Doctor Mounty ($5) came flying on the far outside to win the $47,000 third-level optional claiming allowance. The winning time was 1:36.80 for one mile over a fast main track. The race had originally been carded at the same distance over the Bowl Game Turf Course. Admirals War Chest is one of only five horses to win back-to-back editions of the Maryland Million Classic, joining Timely Warning (1990-91), Algar (1997-98), Docent (2002-03) and Eighttofasttocatch (2013-14). Eighttofasttocatch is the only three-time winner, having taken the 2011 edition. Sunday’s race was the first for Admiral’s War Chest since finishing 10th in the Richard W. Small last Nov. 19 at Laurel. He had four works since early September for his return, three at Sinatra’s Delaware-based farm. Everest Stables’ Maryland homebred V.I.P. Code ($4.60) overtook multiple stakes-placed pacesetter Stroll Smokin in the stretch and held off long shot Big Bella Brown’s late inside bid to win Sunday’s second race, a $42,000 optional claiming allowance for 2-year-olds. The winning time was 1:12.78 for six furlongs. Folk Magic Racing’s 3-year-old filly Folk Magic ($5.40) dueled with Full of Zip from the head of the stretch until edging clear approaching the wire to win the third, a $45,000 second-level allowance moved from the turf to the main track. Favored at 8-5, Folk Magic ran one mile in 1:38.25. Returning to Laurel for the first time since late April, James F. Miller’s Toby Girl ($9.80) ran a mile in 1:38.56 and was a 3 ¼-length winner of Race 4, a $42,000 first-level optional claiming allowance for fillies and mares 3 and older. James C. Wolf’s Miss Cobblestone ($18.40) swept to the lead in deep stretch and pulled away to his second straight victory in Race 7, a $45,000 second-level optional claiming allowance for females 3 and up. It was the second win of the day for trainer Anthony Farrior, who also saddled Toby Girl. A 10-race Columbus Day Holiday program Oct. 9 will kick off the first of 10 Monday cards as part of the newly revamped fall calendar at Laurel Park. Racing switched this month to a Friday through Monday schedule from the original Thursday to Sunday format, in part to take advantage of a premier broadcast presence on the TVG Network. The final Monday program of the calendar year-ending fall meet will be Dec. 18. Due to a special Thanksgiving Day program Nov. 23, there will be no Monday racing Nov. 27. Monday’s second race is a $40,000 maiden special weight for 2-year-olds going a mile on the main track that attracted a field of seven topped by 9-5 program favorite Believe in Royalty. A gray or roan Tapit colt out of the Proud Citizen mare Believe You Can, purchased for as a $900,000 yearling last fall, was third by a length in his Aug. 28 unveiling at Delaware Park for trainer Larry Jones. Five of Monday’s races are scheduled for Laurel’s world-class turf course including the ninth, a $45,000 second-level optional claiming allowance for females 3 and up at 5 ½ furlongs. The eighth race is a $42,000 entry-level allowance for 3-year-old and up going six furlongs on the main track. One lucky bettor solved the 20-cent Rainbow 6 wager at Laurel Park Sunday for a jackpot carryover payout of $10,342.26. Six Tonsafun ($7.20) held off I Just Wanna Win to take the ninth-race finale and complete the winning 6-5-3-2-2-11 combination. A total of $3,243 was wagered into the Rainbow 6 Sunday, which began with a carryover of $7,747. The Rainbow 6 begins anew Monday, spanning Races 5-10. There will be a carryover of $4,885.06 for the $1 Super Hi-5 wager for Monday’s opener. Joseph Besecker’s Gold Braid ($6.20) took the lead after a half-mile and rolled to a 6 ¾-length win in Sunday’s fifth race, giving jockey-turned-trainer Hugh McMahon his 800th career victory. The 3-year-old gelding covered one mile in 1:37.63 over the main track in the $30,000 starter optional claiming for 3-year-olds and up originally carded for a mile on the Bowl Game Turf Course. It was the 18th winner from 73 starters (24.6 percent) in 2017 for the combination of McMahon and jockey Katie Davis. They have finished in the top three 38 times (52 percent). McMahon rode 59 winners between 1990 and 1998, including a high of 29 in 1992. He won with his first starter as a trainer, Flying Retsina Run, on June 9, 2005 at historic Pimlico Race Course. He had single-season highs with 166 wins and $3.98 million in purse earnings in 2013. This year McMahon has 50 wins including the Jameela with Daylight Ahead and the Camptown with Northern Eclipse during Laurel’s summer meet, along with more than $1.4 million in purse earnings. The $50,000 Christopher Elser Memorial for 2-year-olds and $50,000 Donna Freyer for 2-year-old fillies have been added to Laurel’s fall stakes schedule, each to be run on Saturday, Nov. 25. 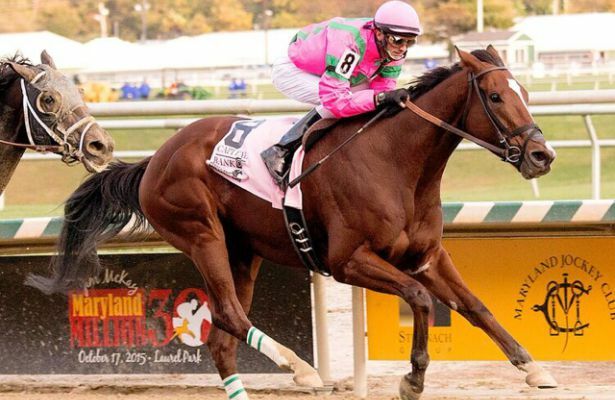 Both races, to be contested at six furlongs, are restricted to horses that spent at least 90 days in South Carolina by June 30 and paid a nomination fee to the South Carolina Thoroughbred Owners and Breeders Association. O Dionysus won last year’s Elser at Parx by 2 ¼ lengths with favored Greatbullsoffire third, both horses being based at Laurel Park. One of the nominees to the Elser is Marathon Farms homebred Whirlin Curlin, a chestnut son of Hall of Famer Curlin set to make his career debut in Monday’s second race at Laurel. Notes: Jockeys Daniel Centeno and Forest Boyce each had two wins Sunday. Centeno took the first race with Keep Your Distance ($7) and the third on Folk Magic ($5.40), while Boyce swept the late daily double aboard Doctor Mounty ($5) in the eighth and Six Tonsafun ($) in the ninth.